Favourite Beef Promotion @ Mmmm! 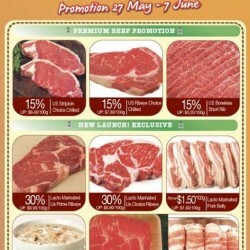 Enjoy and save up to 5% discount on Mmmm members your Favourite Beef Promotion Started now @ Mmmm! One of the widest range of premium beefs in town. Mmmm! is offering their: New BBQ Packages at 20% off. Wagyu Striploin MB 4/5 at 15% off. 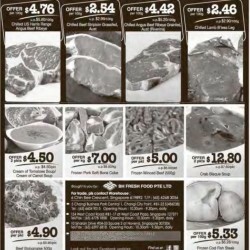 Buy 1 FREE 1 Sukiyaki Pork Collar (Gift with purchase: Teriyaki Sauce) and more. While stocks last. Terms and conditions apply. Visit their website for outlet locations. Mmmm! Eats, Marinates & Much more! 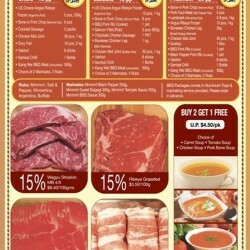 All frozen Shabu Shabu & Sukiyaki cuts at 15% discount. Star Buys Offer Period: 18 to 29 March 2015.